I’ve been taking university classes online this semester. I took four to start with and quickly discovered this is way too many for the phase of life in which I’m currently living, and this is also the reason I haven’t been blogging much lately! One of my courses was a digital imaging course. After these four classes (my exams are on Friday and Saturday) I’ll have 10 more to go to earn my Bachelor of Liberal Arts degree, and hopefully go on to Teacher’s College! I plan on spreading the classes out a bit more to keep my sanity, and should finish up in April 2014, instead of the original finish date of April 2013. Not too shabby. In this one we were supposed to show how we thought technology was helping or hindering our future – I focused on how we can use simple technologies like houses, toys, clean water, food, etc. to help children in developing countries live healthier lives with more opportunity. I hope to help the children globally throughout my life, and I’m praying for God to show me how to best do that. So in the photo, I’m holding a child’s hand (a picture taken during my Dominican missions trip last April) and walking with him into a brighter future than what he is leaving behind. Josh and the boys are waiting in the background as well. 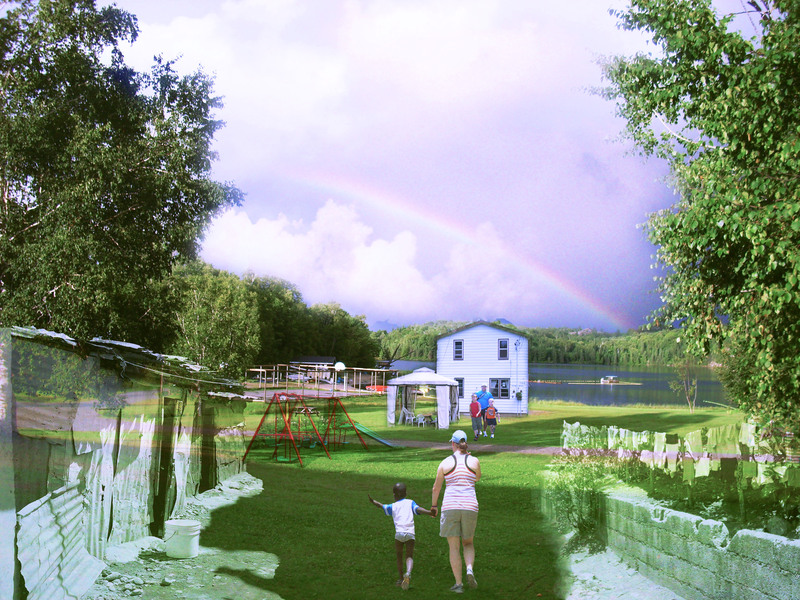 In this photo, we were to take one image and work with it using different styles and techniques. 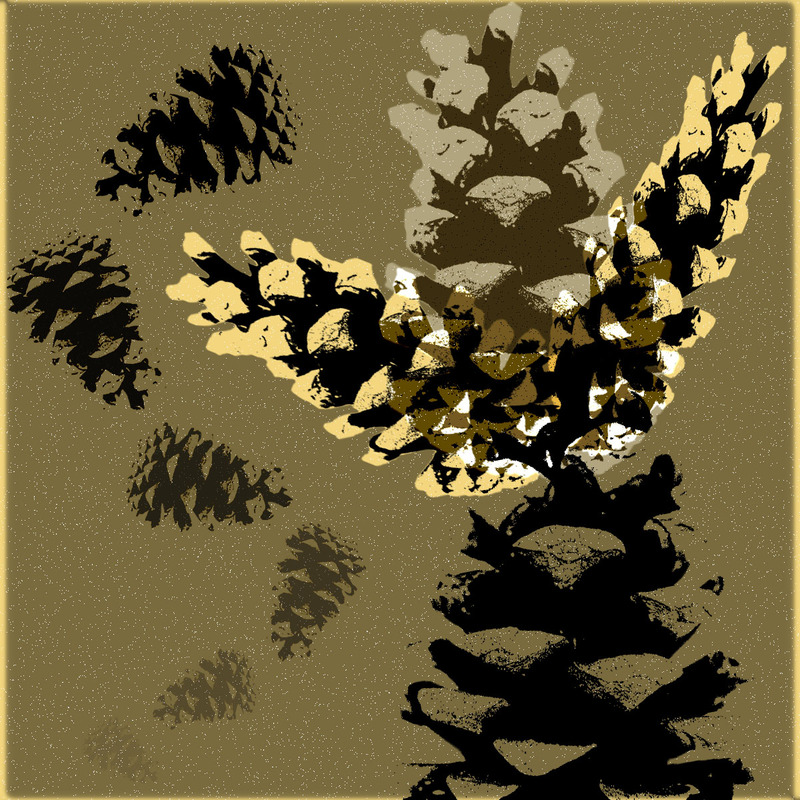 I chose the pinecone and tried to make it represent a little of the emotions I feel when we visit the cemetary. There is a pine tree there and the boys love to play in it, gather pinecones, decorate cemetary markers with them, etc. This photo shows a tree, and the pinecones falling from it, symbolizing the sadness I sometimes feel, the separation I sometimes feel from loved ones at the cemetary. My final mark in this class was 78% and I’m pretty happy with that!! I know that house and gazebo. Beautiful.